While small buffing is needed to make room for porcelain veneers, that doesn’t mean you should have to suffer in the process. That’s why your dentist provides local anesthetic to minimize as much discomfort as possible during placement. Your dentist does everything they can to minimize how much is removed. Additionally, tooth enamel contains no nerves, so little pain is experienced during the buffing stages. In the past, veneers were made to look as bright and white as possible. Unfortunately, this caused them to take on an unnatural appearance, also commonly referred to as “chicklet teeth.” While porcelain veneers are meant to improve your smile’s appearance, they’re also designed to blend in with the rest of your teeth. This way, no one will even notice that you had them placed! 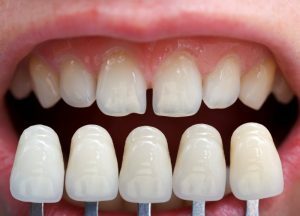 Veneers are typically used on the front teeth because that’s the area most patients request to have them placed. However, you can also benefit from veneers placed anywhere in the mouth, including the lower teeth and the premolars. By doing this, you can effectively even out or widen your smile. A common myth about veneers is the amount of enamel removal that occurs before placement. While some reshaping is needed to fit the veneer, it doesn’t mean you’ll need half the tooth buffed. Most people don’t need any more than .3mm of enamel removed. The amount is determined on a case by case basis, so if you have questions about how much you need to remove, ask your dentist before treatment. Another common myth is that porcelain veneers are exclusively for cosmetic purposes. However, veneers also have the potential to rebuild molars and replace worn or misshapen teeth. Of course, you’ll be able to discuss this during your consultation with your dentist. When it comes to porcelain veneers, you’ll find amazing treatment from the best dentist on Long Island. Schedule an appointment with them to get started rebuilding your smile today! Dr. Allan S. Mohr earned his Doctor of Dental Surgery degree from the New York University College of Dentistry. He places a strong emphasis on cosmetic dentistry and has lectured extensively on topics like esthetic dentistry and conservative restorative dentistry. To learn more about porcelain veneers on Long Island or about his practice, contact him through his website. by: allanmohr at June 8, 2018 .